Robert approached S.Crow Collateral Corp. with this situation: He told us that he owned "Prime Place", an investment property which he had acquired 25 years ago. Prime Place increased substantially in value after that, and Robert took the opportunity in 2007 to take out a loan on Prime Place for about 50% of the 2007 market value of Prime Place. Because of that loan (which he used for other purposes) and his low original cost to buy the property, his tax basis in Prime Place was now zero—or less. Because of the Great Recession, Robert said, the market value of Prime Place had dropped somewhat since 2007, and the rental income which Prime Place had recently generated barely covered the debt service. He had decided to sell. Buck is ready and able to buy. Everything seemed just fine, but then Robert’s tax adviser told him that the tax cost to Robert when the existing debt is paid at the closing—because of Robert’s zero or negative basis—would far exceed the net cash from the closing. Robert told us that he wanted to sell Prime Place, but he didn’t want to be money out-of-pocket to do so, especially in the large amount his tax adviser had calculated. 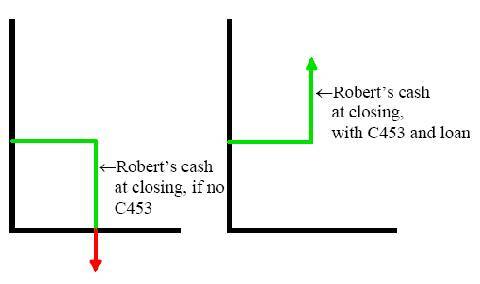 His question to us was this: Could a "collateralized installment sale" (also called "C453" for short) transaction solve his problem? Our answer was yes, when in tandem with a particular kind of new loan transaction, and we explained how. After he heard the story, we reached ageement on deal terms, and we completed the transaction last week. S.Crow Collateral Corp. bought Prime Place from Robert on a 30-year no-money-down installment contract. Without delaying Buck at all or complicating things for him, we re-sold Prime Place to Buck for the same price at which Robert would have sold to Buck. (Our installment contract with Robert will give S.Crow Collateral Corp. a price break at the end of the 30 years, if we fully perform as agreed throughout the 30 years.) Because S.Crow Collateral Corp. did not pay any of the principal yet—and won’t for 30 years—Robert can report the sale on IRS Form 6252 as a fully tax-deferred installment sale. We introduced Robert to a third-party lender which agreed to lend to Robert an amount equal to 95% of the purchase price in our contract with Robert, and to use part of the loan proceeds to refinance Robert’s debt that otherwise would simply be paid at closing. The new loan is not secured by Prime Place, so Prime Place passed free and clear to Buck. Robert received the remaining loan proceeds and is able to defer the tax, so he came out of the deal with more cash than he had before, rather than much less. S.Crow Collateral Corp.’s installment payments and final payment to Robert will fully fund both his monthly loan-interest payments and the lump-sum loan-principal payment at the end of the 30 years. The lender is willing to agree to these terms, because of S.Crow Collateral Corp.’s long-term relationship with the lender and the lender’s consequent confidence that S.Crow Collateral Corp. will pay Robert as agreed. Nevertheless, the lender acquires no interest in or rights to the installment contract or to the money that S.Crow Collateral Corp. promises to pay to Robert. So, Robert’s 2007 debt was refinanced rather than just paid, and Robert is able to defer the tax on that money, as well as on his other gain, for 30 years. He will have to continue paying on the debt, but S.Crow Collateral Corp.’s payments to him will provide the money with which to do so. He may now invest the net loan proceeds as he wishes, so he should have more money with which to pay the tax 30 years from now.